Wheeler Gorge Campground is perhaps, one of Southern California’s best kept secrets, built by the Boy Scouts nearly a century ago. Wheeler Gorge Campground contains numerous sites adjacent to a picturesque stream and rocky mountains. 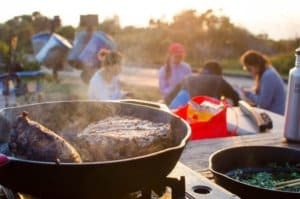 Perfect for families and tent camping, each site contains a table, bbq, and fire ring. Great home base to explore Matilija Creek, the town of Ojai, or the surrounding Wilderness Areas. The campground is open year-round and offers dozens of single-family sites for tent or RV camping. Some sites are available on a first-come, first-served basis, however reservations are recommended. Parking spurs are paved and vary in length, accommodating RVs up to 35 feet. Each site is equipped with a table and campfire ring with grill. Accessible vault toilets are provided, but drinking water is not available. Visitors must bring their own water, and remove their trash from the campground. The Wheeler Gorge Nature Trail begins at the upper end of the campground. It is a relatively short loop that leads through thick vegetation along the creek banks and to a hillside view of the area. Wildflowers often bloom along the path. The creek flows near some of the campsites and a small swimming hole is frequented near the side of the highway. Fishing is rough in the area and may produce a catch of trout, but the stream is not stocked. Kayaking or canoeing in the creek is not recommended. Ventura and the Pacific Ocean are about 20 miles south of the campground. 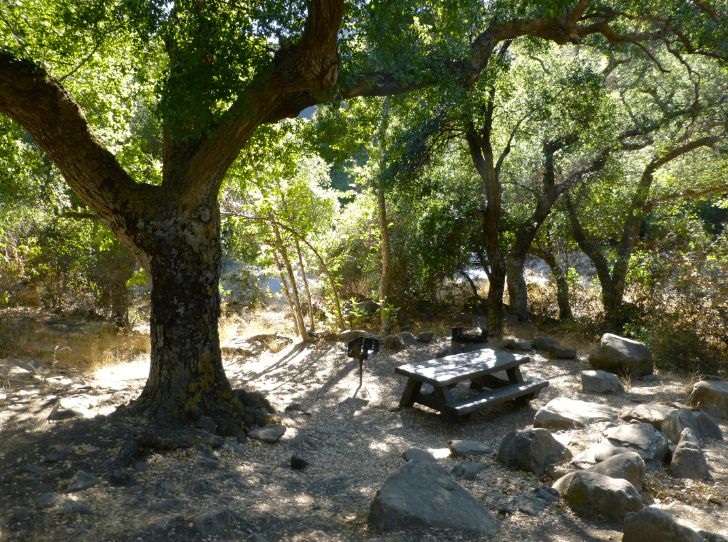 The campground is adjacent to Matilija Creek, and is bordered by a mixed forest of oak and sycamore trees and evergreen shrubbery. Most sites are shaded and summer temperatures reach up to 95 degrees. The campground was originally built by Boy Scouts nearly a century ago, as well as a historical stone home that is also on-site.